Motorcycle engines consist of pistons, a cylinder block and a head, which contains the valve train. The pistons move up and down in the cylinder block, driven by explosions of a fuel-air mixture that has been ignited by a spark. Valves open and close to allow the fuel-air mixture to enter the combustion chamber. Thus, the crankshaft, sometimes abbreviated to crank, is responsible for conversion between reciprocating motion and rotational motion. In a reciprocating engine, it translates reciprocating linear piston motion into rotational motion, whereas in a reciprocating compressor, it converts the rotational motion into reciprocating motion. In order to do the conversion between two motions, the crankshaft has "crank throws" or "crankpins", additional bearing surfaces whose axis is offset from that of the crank, to which the "big ends" of the connecting rods from each cylinder attach. For the pistons to work properly, a piece of the engine called the camshaft must rotate and open the intake and outtake valves. These valves open and close to allow the flow of air, which is necessary to create an explosion, into the cylinder. 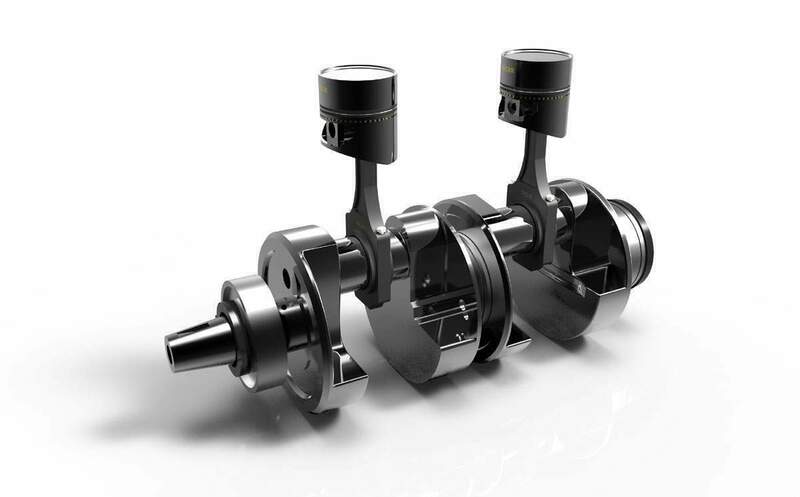 The crankshaft is connected to the camshaft and causes the camshaft to rotate along with it. This ensures the two engine parts work together and are never out of sync. The crank moves the pistons up and down inside the cylinders. The movement of the pistons is regulated by the crank. A component known as the camshaft also ensures that the pistons work properly. Whenever the crank rotates, the camshaft must also rotate along with it. This is because the two components are linked together. The two engine parts have a synchronized movement. When the camshaft rotates it causes the intake and outtake valves to open. This allows a flow of air which is important to cause explosions in the cylinder. 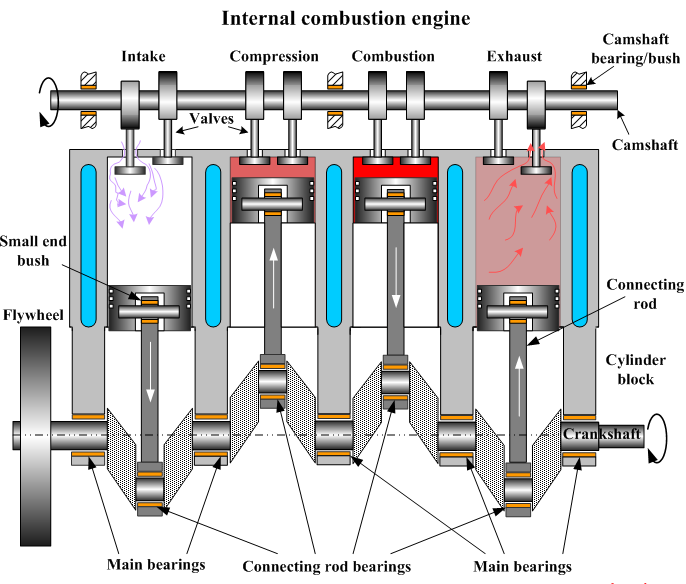 Explosions are created inside the cylinders in the engine. The explosions exert pressure on the pistons so that they maintain their movement. These explosions result in movement of the wheels. The moving pistons give rise to jerky movements. The flywheel which is found at the end of the shaft helps to ease the erratic movement. When the shaft moves, it causes the flywheel to adopt a circular motion. Notches in the flywheel help it to achieve a more regular motion. This motion eventually causes the vehicle’s wheels to turn since the flywheel is connected to other engine parts. Within this cylinder is a piston. The piston moves up and down within the cylinder depending on what is happening at that particular moment. When the air fuel mixture is put under pressure, the piston moves up…it actually does the pressurising. The explosion however, forces the piston back down and the process is repeated. And this is where the crankshaft is useful. The part of the piston that is not located inside the cylinder is attached to the crankshaft by a connecting rod. Every time it moves up or down, it rotates the crankshaft. This rotational movement is the power that is eventually transferred to the tyres, moving the vehicle forward. If you have been alongside a truck and you happened to see a long metal rod running from front to back and rotating at a high speed, you know what I am talking about. The crankshaft is doing that. This should tell you how fast that rotation movement is. This is the origin of the word revs. It is not some complex petrol head term. It just means the number of the crankshaft’s revolutions per minute.